Société Santé en français, in partnership with 16 French Language Health Networks (FLHNs), enhance community capacities and health systems. Healthbound 18-23 is the opportunity to display, more clearly than ever, the results of health systems and politics transformations leading to better access to quality French-language services. Networking is the heart of Société Santé en français actions. 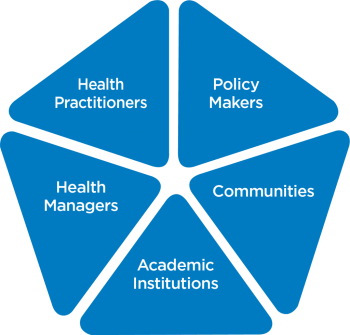 Five kind of partners are essentials to health systems transformation: policy makers, health practitioners, health managers, academic institutions and communities. Accessible, adapted and actively offered French-language health services and programs in Canada. Mobilized, equipped and valorized human resources offering French-language health services. Health establishments, programs, and policies demonstrate the capacity to offer quality and safe French-language health services in accordance with language of service standards. Systematic collection of the language variable by provinces and territories, thereby providing access to evidence-based planning and decision-making. Strategies are deployed to meet these key visions and, ultimatly, ensure that Francophone and Acadian communities in a minority situation have the capacity to fully experience their health in French.